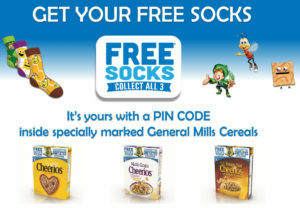 Free Pair of Socks with General Mills Cereal! Home » Clothing & Accessories » Free Pair of Socks with General Mills Cereal! This offer begins on March 5th, 2018, and is available WHILE SUPPLIES LAST or until July 31st, 2018, whichever comes first. You need to have a Life Made Delicious account to submit your PIN for the free socks. You can create an account with an email address or sign in with Facebook. If you are posting this for people to order stop making it so damn difficult. They are only socks. People should be able to submit their code and address only to recieve them done deal instead of having to buy into alot of other deals they are not interested in. I thought they would be cute for my grandson but no i should not need to send you all my account info friend list etc. it is not worth it.